Never underestimate the value of a small gesture. That was the comment of a UK port chaplain after he responded to an unusual, but not surprising, request from a visiting ship’s captain. The captain had told the priest: “What my crew would really like is to walk on green grass. All they get to walk on is steel.” So the priest took them to a churchyard, where they all walked barefoot for an hour. 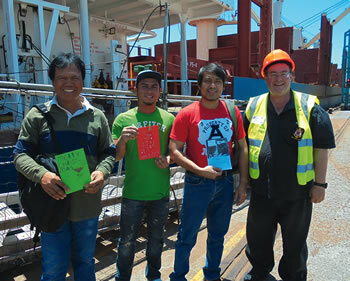 This story of practical mercy is one example of the myriad of ways the Apostleship of the Sea helps seafarers worldwide, including at centres here in New Zealand. Shipping is a huge industry around the world. According to a Sea Sunday presentation by the Apostleship of the Sea (UK), there are an estimated 100,000 ships at sea worldwide, with some 1.5 million seafarers. If the containers of one company, Maersk, were lined up, they would stretch some 18,000 km, more than half way around the Earth. A highly competitive industry leads to a lot of pressure to minimise costs and has safety and pressure of work consequences for seafarers. The Maritime Labour Convention 2006 is one vehicle for protecting the rights of seafarers, but vigilance to ensure ongoing compliance is essential. The International Transport Workers Federation (ITF) has recently commissioned an in-depth study into the implementation and enforcement of the convention, after reports of numerous breaches. The modern seafarer has to be a hardy, resilient type in order to survive. Private space is very limited on most ships. Seafarers work in an industrial environment, pervaded by the vibration of massive engines. There is no opportunity to escape your environment. Pressure is on to load and unload vessels as quickly as possible to reduce port charges, so opportunities for shore leave can be limited. Shore leave is typically measured in hours rather than in days. Surveys by seafarer welfare organisations have borne out what I have observed from the seafarers I have encountered as a port chaplain – that a major desire is communication with family back home. 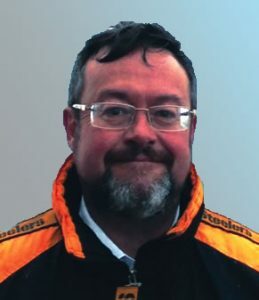 While some ships are improving their game as far as on-board connectivity is concerned, others offer very limited communication options to seafarers. More than once at our centre in Auckland, I have been invited to look into a smartphone screen and wave to a smiling mother and toddler in the Philippines, at the behest of a proud seafaring father. The Apostleship of the Sea can offer help in several ways. For seafarers who can get off their vessels, internet connection or landline phones are available in seafarers’ centres. For those who can’t get off their vessels, sim cards and top-ups for ubiquitous smartphones can be taken on board vessels by ship visitors. Other small acts of service that centres in New Zealand offer include currency exchange, operating small shops that sell souvenirs, toiletries, basic food and drink, and even taking seafarers on shopping excursions or taking them to a church service, visiting them in hospital or comforting them in times of bereavement. One of the things I’m often asked by seafarers is where shopping centres or food halls around Auckland are. On other occasions, a seafarer will come to the AoS with an issue over a contract, or will speak of bullying on board. One of the most common problems is a seafarer not being paid. 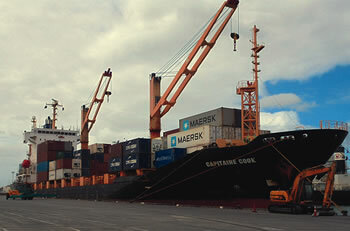 In the last two years, the ITF recovered more than US$88 million in wages for seafarers. The role of the AoS in these situations is to take careful notes and to refer the issue and the seafarer to organisations like the ITF, which has an agent in New Zealand. I’ve done this twice in my seven months as port chaplain. 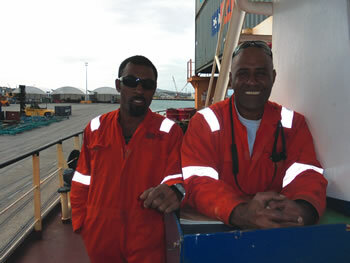 The Church recognises the importance of caring for seafarers. New Zealand’s bishops have designated one Sunday in July each year as Sea Sunday when the focus is on such matters. Many of the seafaring centres in New Zealand are ecumenical enterprises, where the AoS partners with other organisations like the Anglican Mission to Seafarers and the interdenominational British Sailors’ Society. One day, when I had finished ship visiting, I was walking along Quay Street in Auckland a few metres behind a group of seafarers. One eastern European seafarer stopped beside a pohutukawa tree planted in the footpath. He wrapped his arms around the trunk and held it for at least 30 seconds, pressing his cheek against the wood.